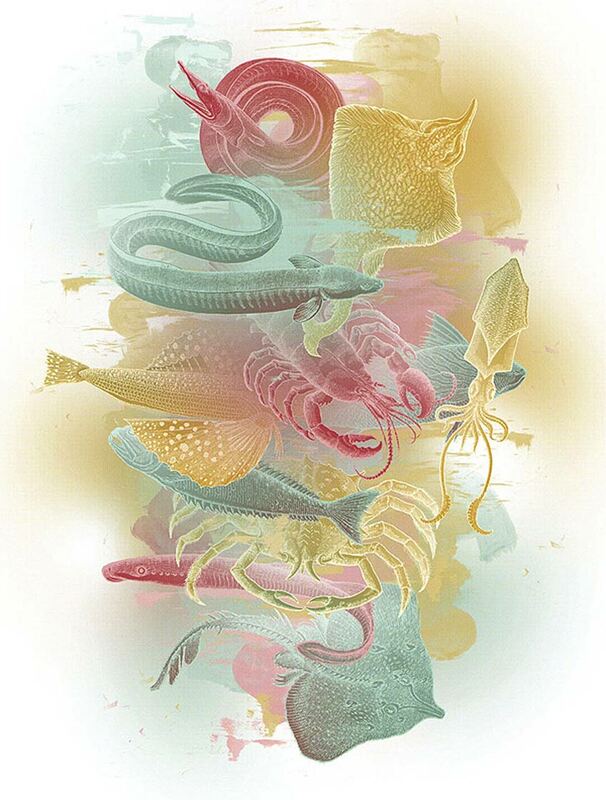 T-shirt design is the new hot topic on the web, and missing out on this big catch would be a shame. In this tutorial, we’ll create a design by mixing some awesome resources and using our artistic eye for color and composition. We’ll also learn the advanced techniques needed to prep this t-shirt for four-color process printing. In case you’re not actively involved in t-shirt design, let me say it’s easier than you think. The first thing you need to do is understand how t-shirts get printed. 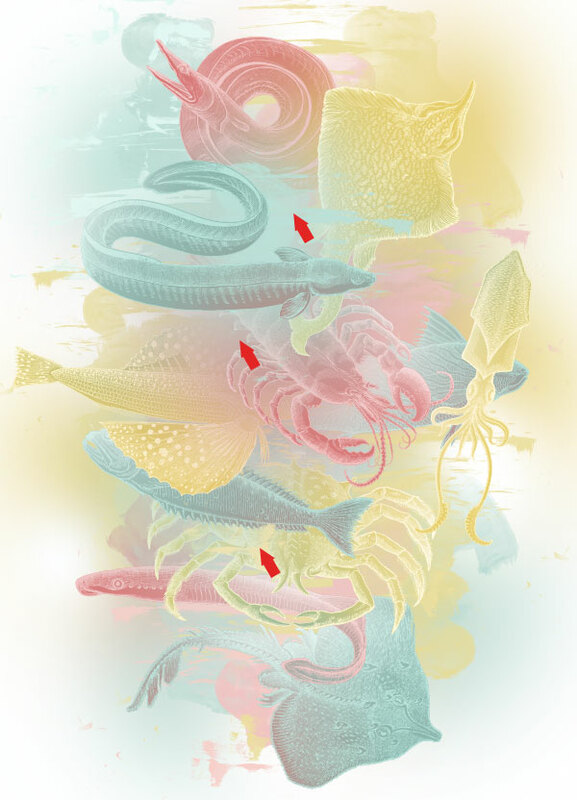 The most common printing method is Spot Color Screen Printing. If you haven’t read it already, check out this great Envato Tuts+ tutorial on the topic: Create a Three-Color Illustration for Screen Printing. With Spot Color, you get well-defined lines and rich color, which makes it a popular choice. But what if you want a design that is not made of only flat imagery such as vectors? What if you’d like to use real photographs, special effects, or a multitude of glows, gradients, and textures? Well, that’s where Process Printing comes along. 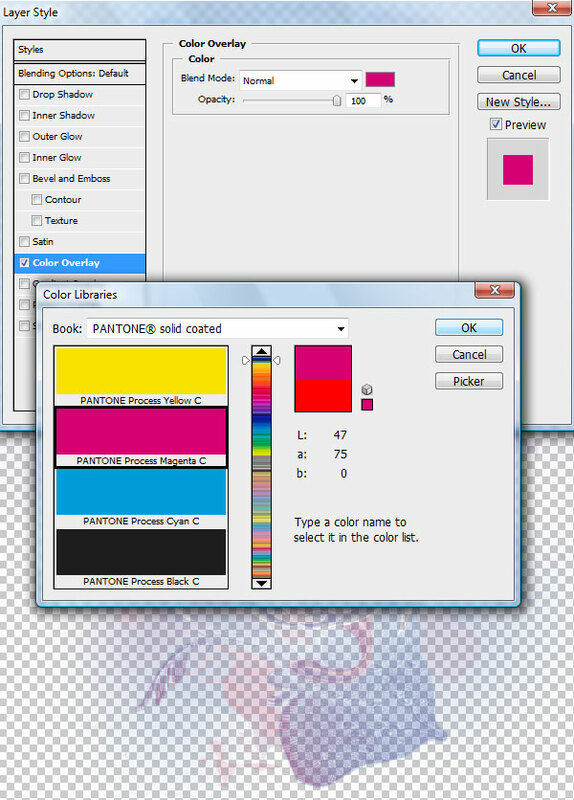 Instead of pre-choosing all the colors in the design, with Process Printing, you design first, and separate all the obtained colors into Cyan, Magenta, Yellow, and Black. Since CMYK has its limitations, there is a newer method that consists of adding other colors to the inks, such as Green and Orange for a larger gamut. 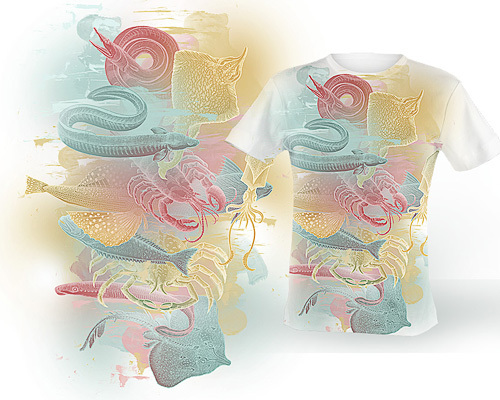 In this tutorial, though, we’ll create a design and prep it for Four-Color Process Printing. First, let’s talk a little about the design we’re about to create. I came up with it in an effort to make something that relies not on drawing techniques, but rather artwork that is easy to work with and reproduce. Designing such a shirt is as easy as modifying the right resources found on the net for free. There are little treasures scattered all over the web these days, and these brush packs we are about to use are no exception. With the right tools, you can not only practice your Photoshop skills, but make money too by submitting your work to t-shirt sites that rely on design submissions, or join online printing contests. If you’re thinking about doing something like that, here are a few tips that I can give you based on my short experience in the field. Don’t go looking in the back of the fridge for leftovers. You may like some of your abandoned designs that fill unused folders, but the apparel industry probably doesn’t. Create fresh themes that consider current topics and trends. This is clothing, and people want to wear what they and others like to see, not what you’d like to see them wearing. You’re not only trying to get approved and win some quick cash, but you want to see your shirts being sought after and bought. That will generate more exposure for your work and lead to greater earnings. 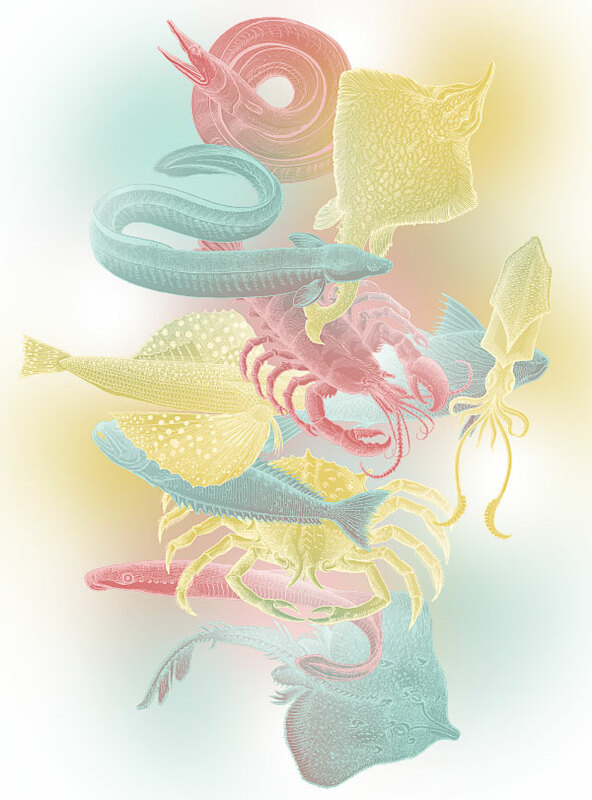 At the moment, most t-shirt sites are like a big bunch of sardines. You want to be a big fish. Everyone’s chaotically trying to have designs approved and doing their best to gather votes and good impressions from everyone. Since the supply is much larger than the demand, you need to stand out from the crowd and offer something different, something original. You need to strike a balance between your own artistic vision and what people like. Trends aren’t made by people that spend their time following them, but by those that are capable and willing to make a distinctive mark. If your design is a submission, it’s always tempting to put it on the site as soon as you’re done with it. There are always improvements to be made, so don’t submit a design you mocked up in a few hours. Give it time, review it, refine it, and then post it. You’ll feel sorry when you see it on the site and think: ‘If only I could change that tiny part, it would be so much better.’ Unfortunately, it’s too late. So here is what we’re creating: a t-shirt design I named “Aquarush.” It’s a colorful and odd mix of sea creatures. 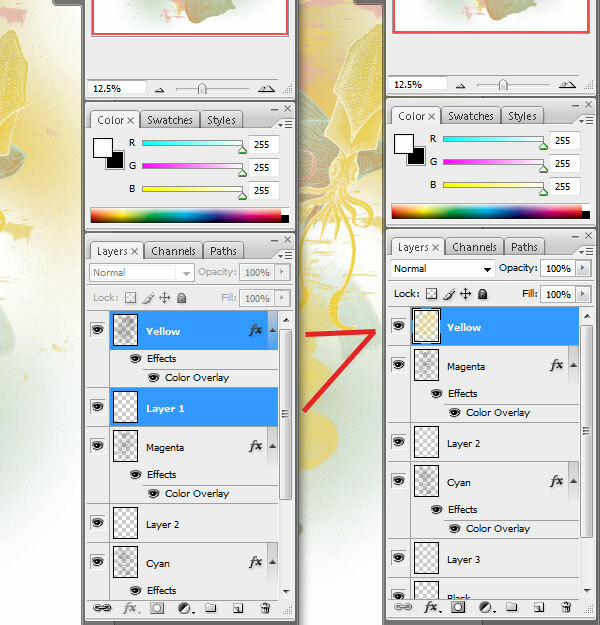 In the following steps, we’ll recreate the image and strip it into the four CMYK colors. 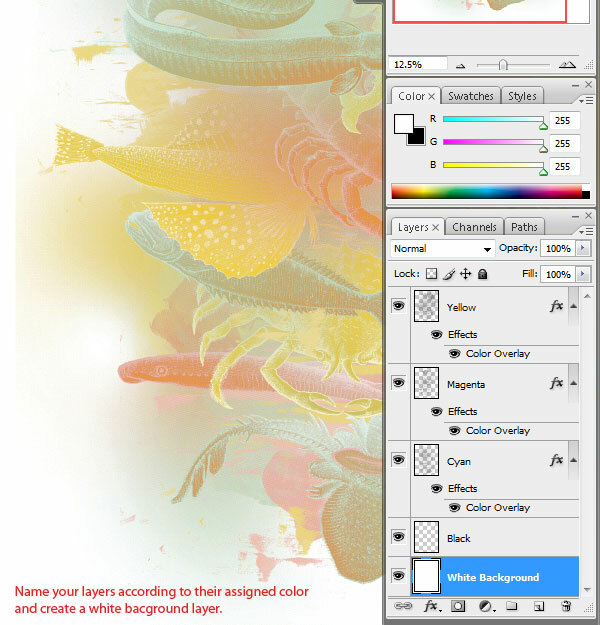 Open Adobe Photoshop and create a New Document. Make it approximately 20 inches in Width and 25 inches in Height at 300 ppi, and choose CMYK as the color. I say approximately because the graphic edges fade into white, so the exact size really doesn’t matter. When it comes to t-shirts, always check the company’s requirements for sizes and do your best to go over them, just to be safe. A larger than needed file is always better than a smaller one. 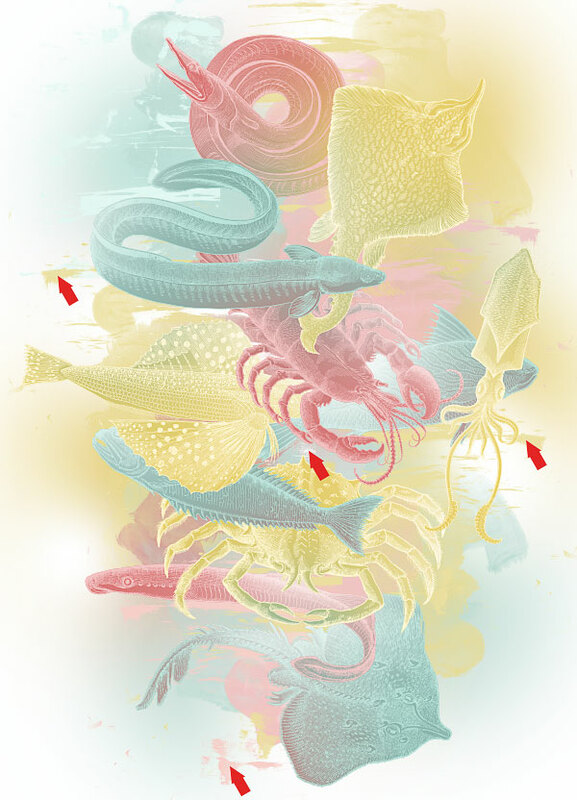 First, download the “Sea Creatures” brush packs: Vol 1 and Vol 2. 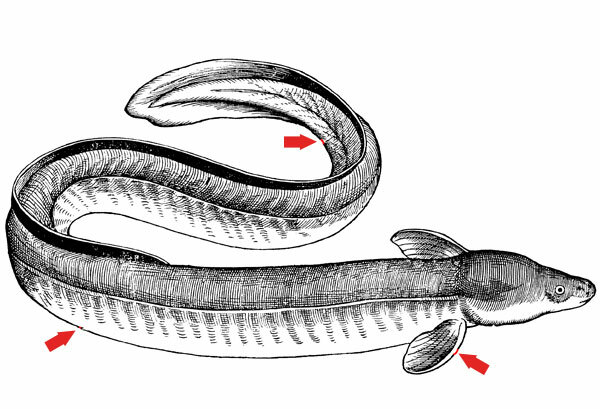 Load the packs and draw the fish shown below. 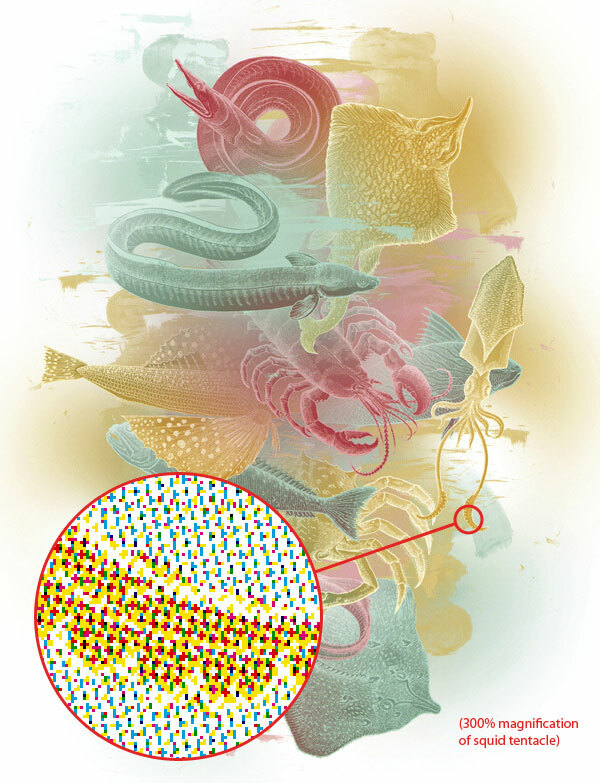 All the fish that we are about to paint on a blank layer are created at the original size of the brush. 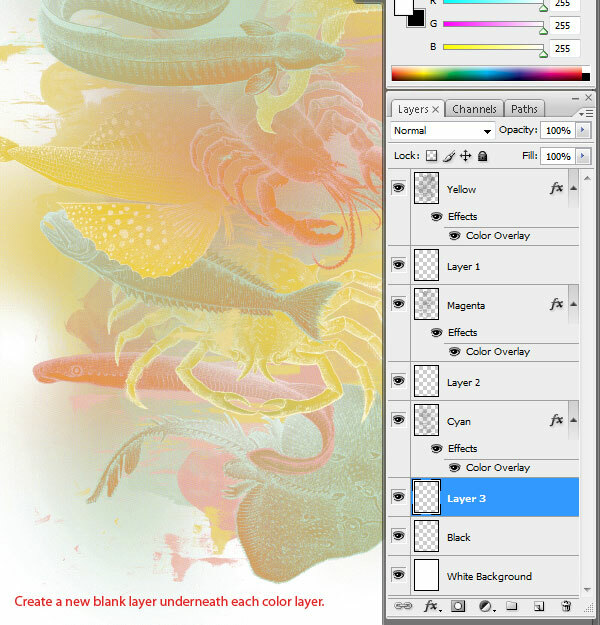 Don’t change their size, but simply create a new layer, select the highlighted fish shown in the menu below, and paint it on the blank layer with black. 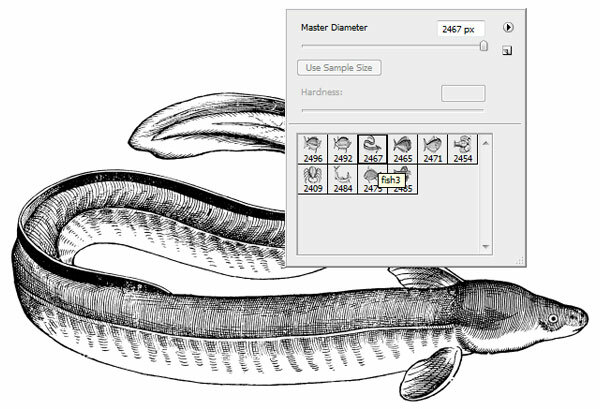 We could manually paint a background color for the fish, but making a selection will be much easier and faster. But to do that, you’ll have to find the small gaps in the outline and fill them. They are highlighted in red below for easy spotting, but make sure yours are painted with black. 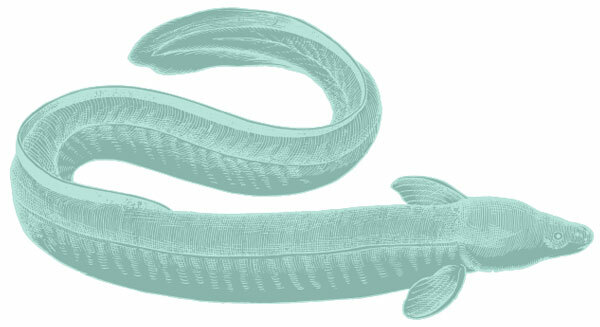 Draw directly on the fish layer. 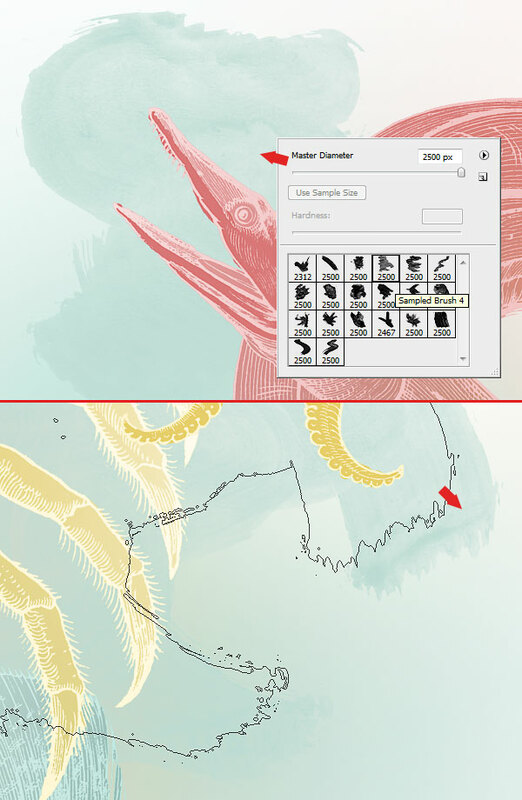 Select the Magic Wand Tool (W) and make a Selection of the white canvas found outside of the fish. 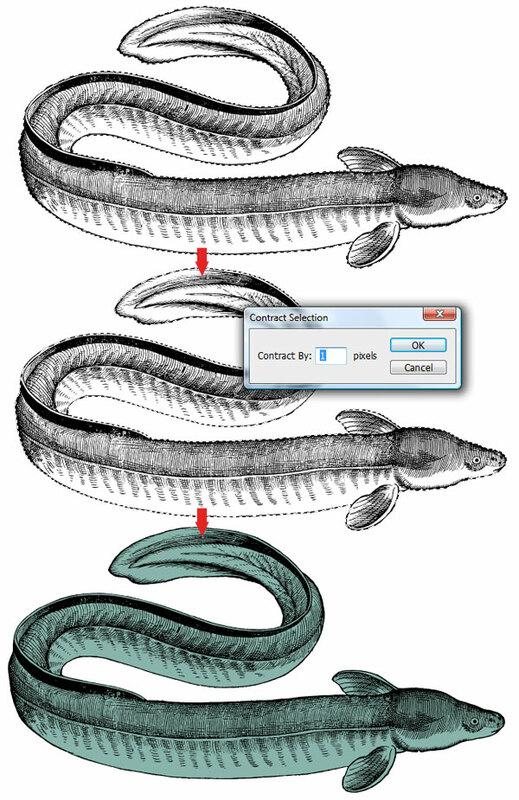 Invert the selection (Command-Shift-I) and Contract it by one pixel by going to Select > Modify > Contract. 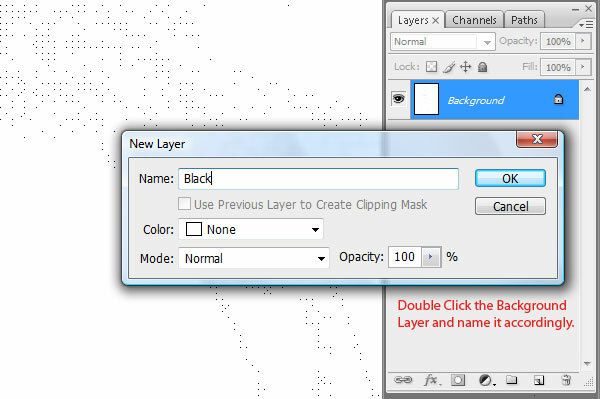 Command-click on the New Layer icon to create a New Layer underneath the “outline” layer. 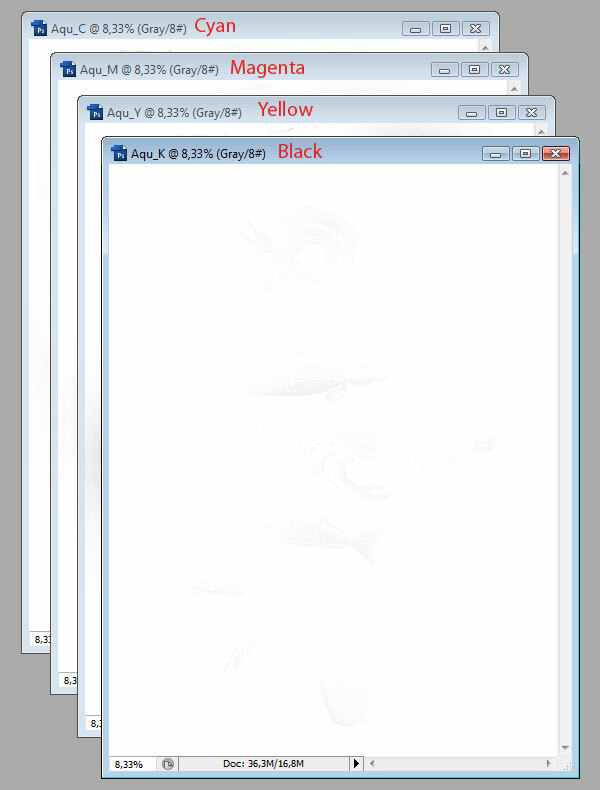 Fill this with cyan (#89b4ac) by choosing the color and pressing Alt-Backspace. Double-click the “outline” layer and add a Color Overlay with this lighter cyan: #b9e3db. 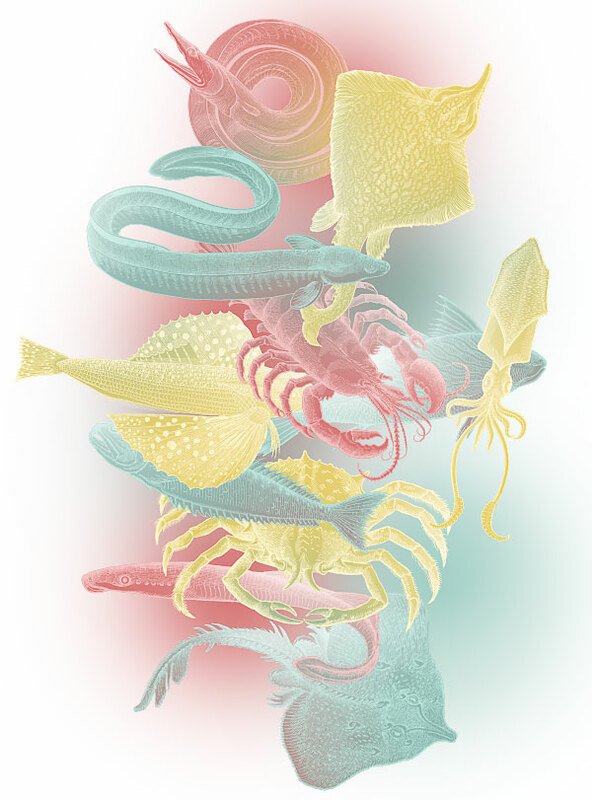 Create a New Layer below the “outline” layer and make it a Clipping Mask for the fish background color by clicking between the two layers in the layers menu. Use a red color (#d97777) and paint on one side of the fish. It’s time for a red one. 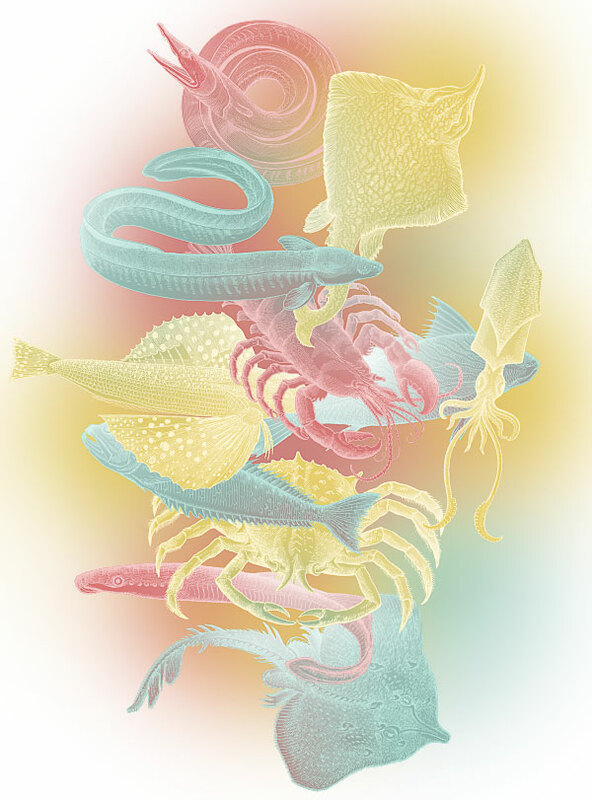 Set these colors for the lobster: body at #d97777, body shading at #89b4ac, and outline at #f3c3c3. From now on, all the colors that we’ll use in the rest of the design will be these basic three colors and their variations (outline lighter version). Also, for some fish, just as I created the body shading, I create a body highlight by painting in the same way with a Low Opacity white. You’ll notice it easily on the blue fish (furthest left side). 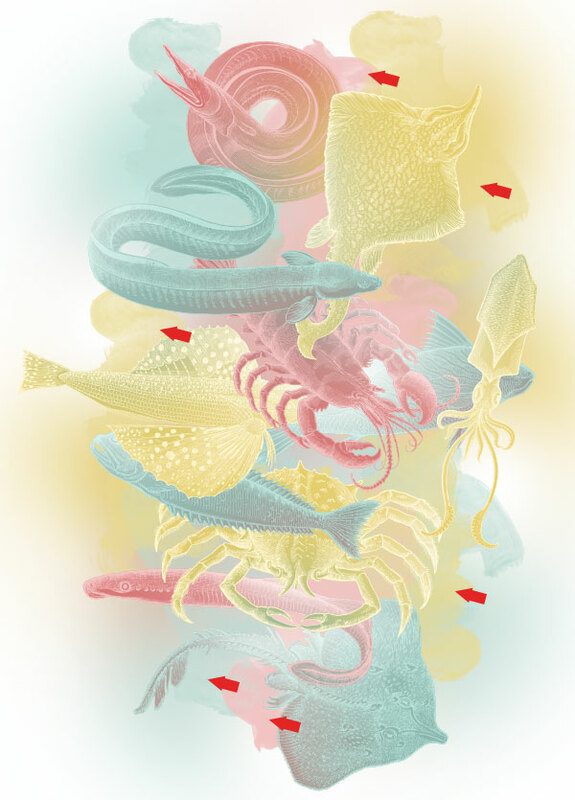 While still leaving some white space between the fish, finish the layout by creating all the other fish in the same way. And just to make this more fun, let me remind you that for each, you’ll have to fill the outline gaps, create the body color, body shading and outline, and then position them in such a way as to create an aesthetic composition. 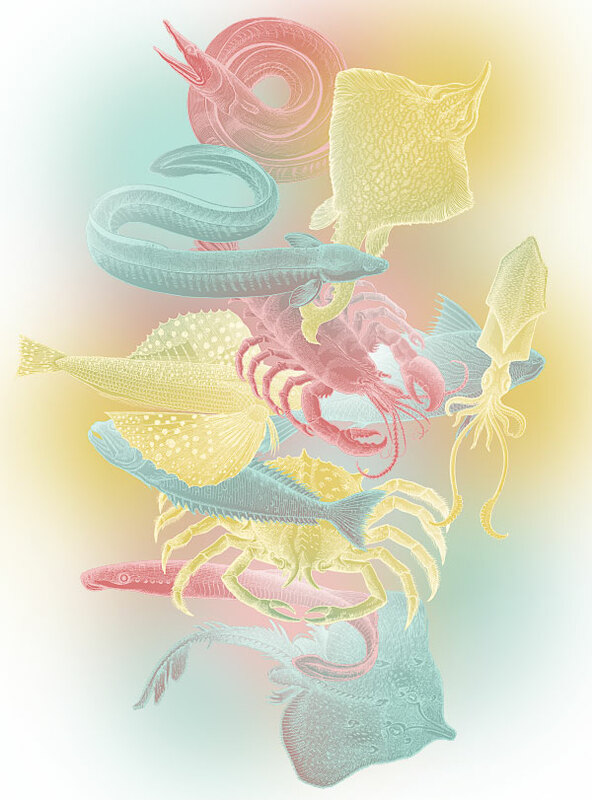 You’ll also have to designate colors to groups of fish so as to achieve chromatic balance. Cheers! For these following steps, you’ll need a Bittbox freebie: Watercolor Set II. 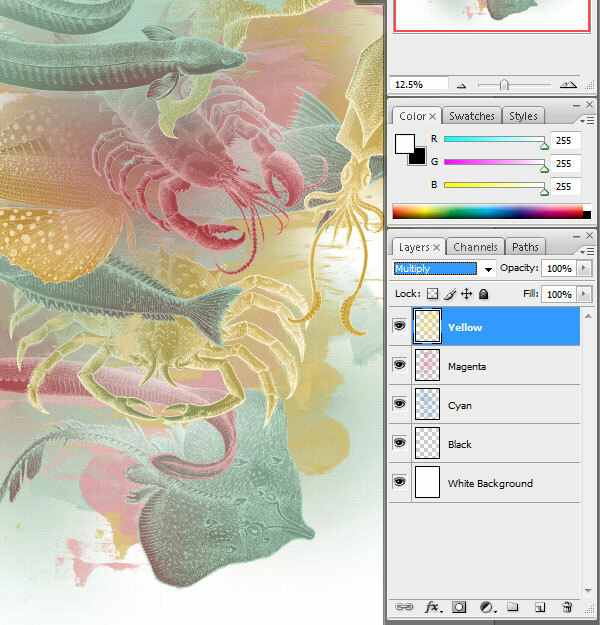 Load the pack, select the lighter cyan (outline color), and paint a large stain on a layer above the soft effects. The arrows indicate newly positioned watercolor stains. Place your own similarly. Don’t overdo it—just a few will suffice. Try to place yellow stains on yellow soft glows, red on red, and cyan on cyan. It will render a smooth transition from glow to watercolor details. No matter the number, keep them on a low profile so they don’t become distracting or too prominent. Now that we have the big picture and all the color interactions settled, let’s alter the colors slightly. Above all the layers, add a Selective Color Adjustment Layer by going to Layer > New Adjustment Layer > Selective Color. 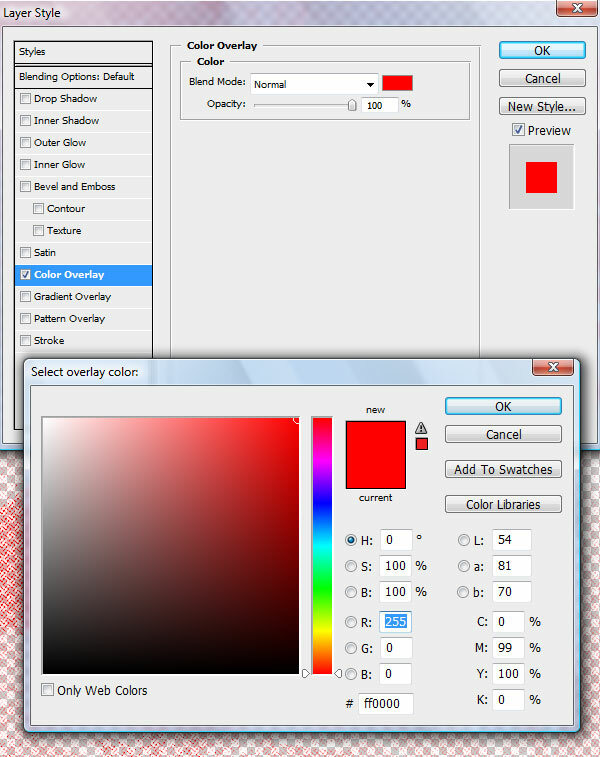 Change only the colors shown below by selecting them in the Colors drop-down menu. 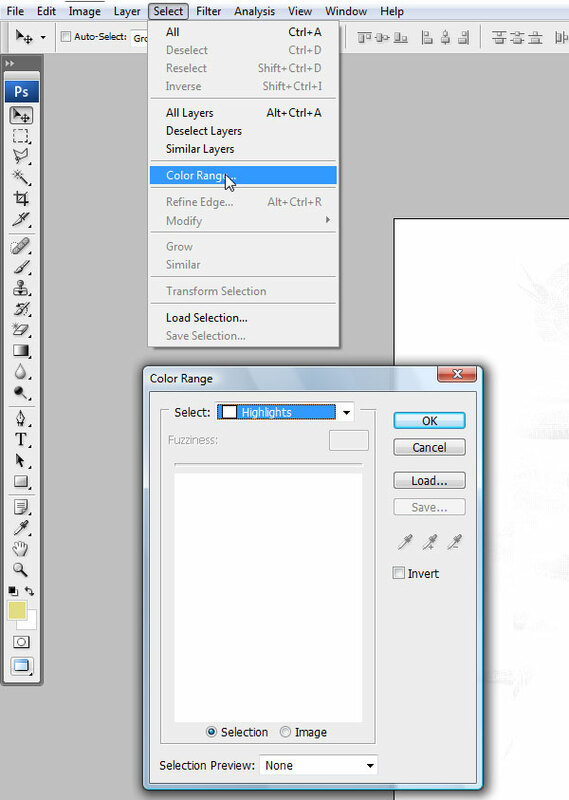 From the same place in the menu, add a Channel Mixer Adjustment Layer. Chose the highlighted preset from the drop-down menu and press OK. Set the layer’s Blending Mode to Multiply and Opacity to 40%. You can see the new colors in the screenshot below. It’s now time to convert the document into a print-ready file. 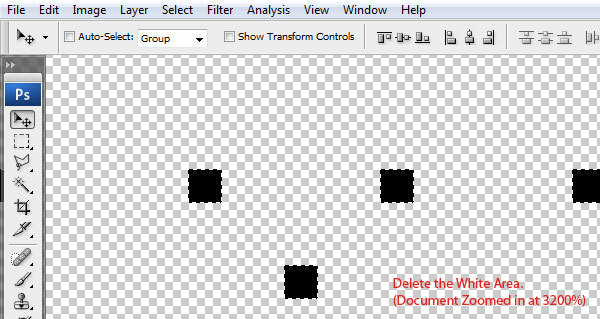 Save the document as a High Resolution JPEG. 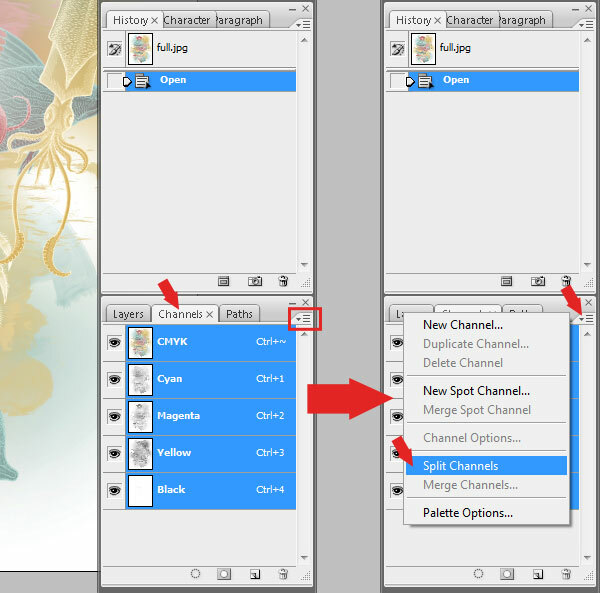 Open the flattened image in Photoshop and select the Channels menu. Since we are in CMYK Mode, we’ll see the CMYK channel, which shows all the colors in one channel, and then each color with its own designated channel. We not only want to separate our file according to each channel, but also to make it screen printable. To do that, we’ll have to strip the image according to the four Pantone Process Colors, and then Convert them to Halftones. You may find Jimmy Heartcore’s video very useful while following the next few steps. It corresponds to most of what we are about to do. 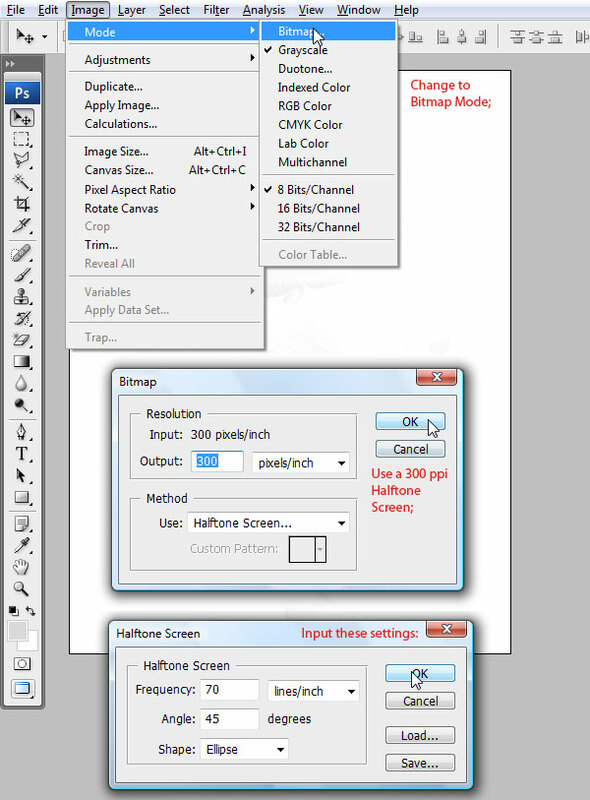 Photoshop automatically strips the channels into individual documents, making our life extremely easy! 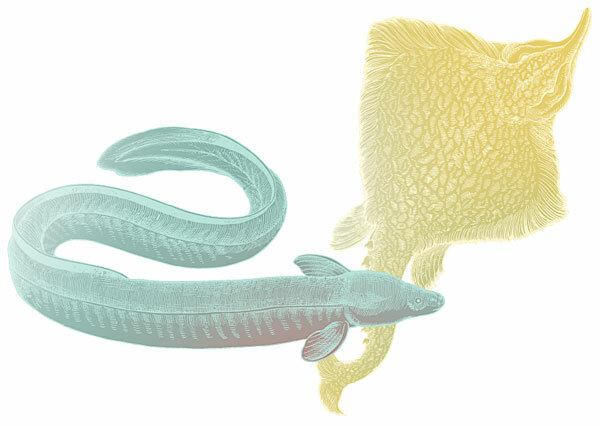 It will name them with the first three characters of the original file (mine being named “Aquarush”—the name of the design), followed by the first letter of the color. Always keep track of the color you’re working with, and don’t mix up the documents or close them until you are finished. Start with the black, or “Aqu_K” document. You may not see much in there, mainly because this design is very soft and lacks contrast, but you’ll notice it in halftone mode. 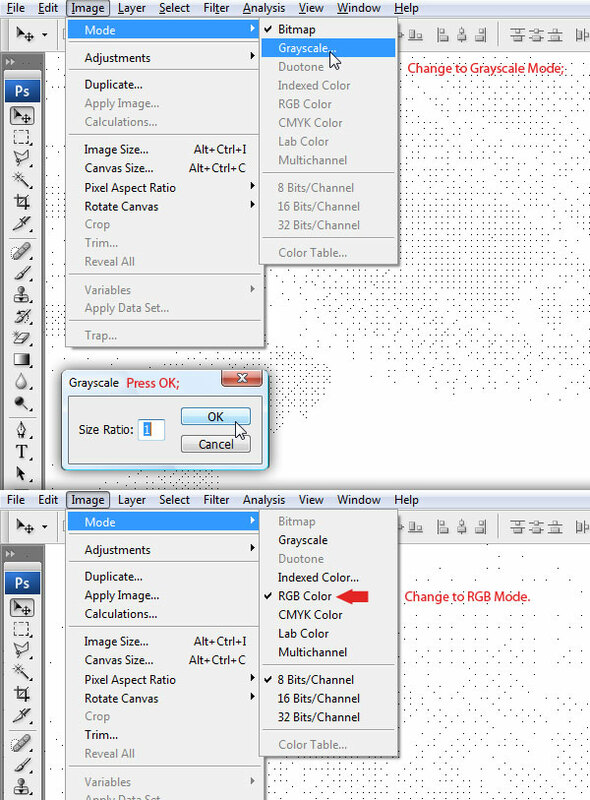 While working in the black color separation document, change the Image Mode to Bitmap. You’ll then be prompted to select a Resolution and Method. Your Output depends on the screen mesh that the printer will use. You’ll need to check with them, and verify that your output corresponds with their mesh. In this case, type 300 in that field and select a Halftone Screen. 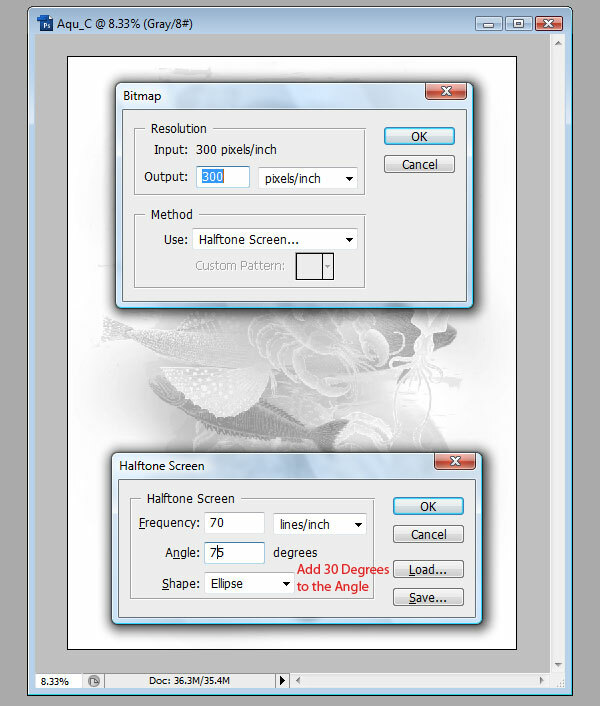 A second window will now appear in which you need to specify the Halftone Screen settings. You calculate the frequency of the halftone pattern by dividing the screen mesh value by 4 (a 305 mesh is what we’re creating this design for), so 305 / 4 = 76.25. 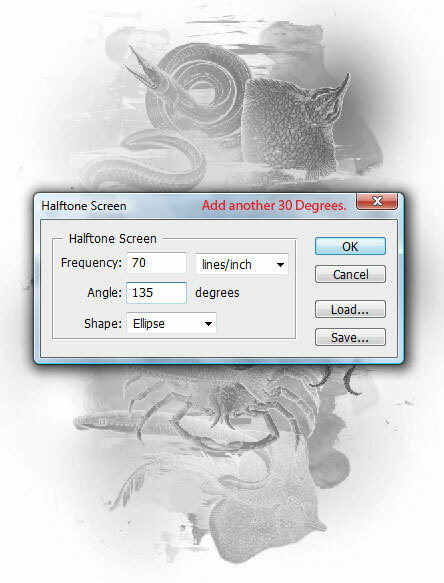 This number will be the maximum frequency you can use for a 305 screen mesh. Since we want the halftone to be barely visible, we’ll use a very close value to what we came up with: 70. Also, set a 45 Degree Angle. After creating the black color sep, we’ll add 30 Degrees to each of the following colors. So Cyan will be 75, Magenta 105, and Yellow 135. And finally, select the Ellipse shape and press OK. Since it’s a background layer, you can’t get transparent pixels. 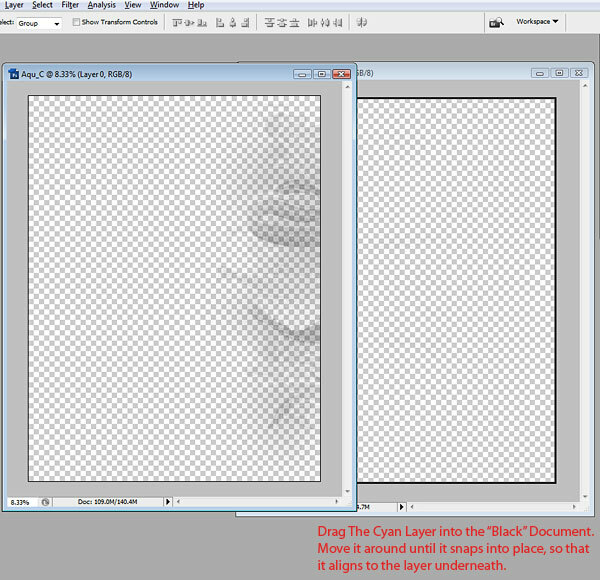 In order to delete the white section of the file, we need to turn it into a normal layer. Double-click on the layer and name it. Put the black document aside and go to the cyan one. 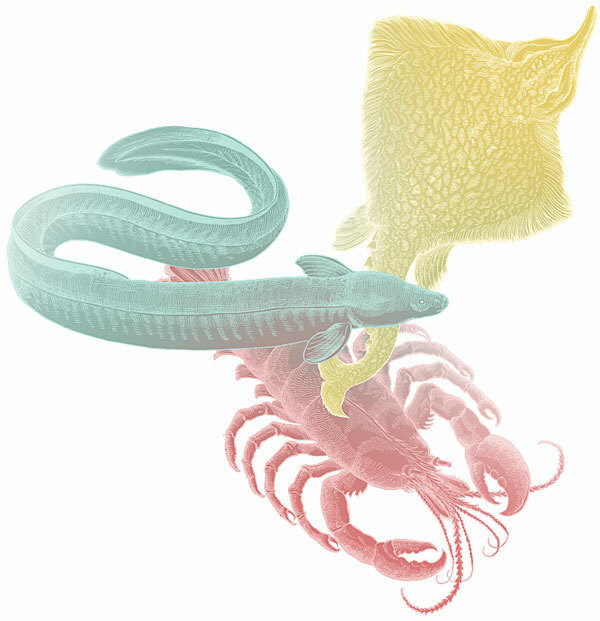 Just as before, repeat the process to create a similar Halftoned color sep. 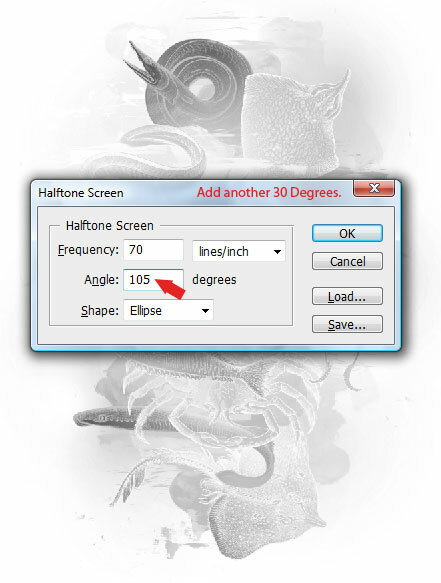 However, remember to add 30 Degrees to the Halftone Screen’s Angle. Now that you have the black halftone ready to be used, drag the layer into the Black document. Aligning them may be a bit tricky, but Photoshop’s snapping ability will make it easier. Zoom out a lot, and Snap the Cyan Halftone to the Black one. 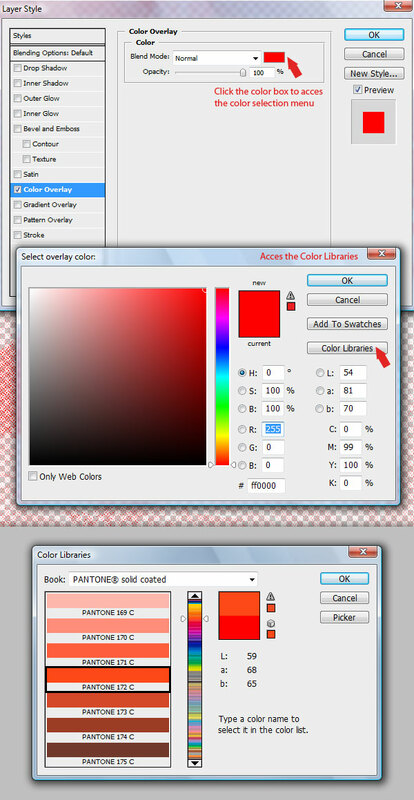 You need to click where the red arrow points inside the Color Bar to find the four Process CMYK Colors. 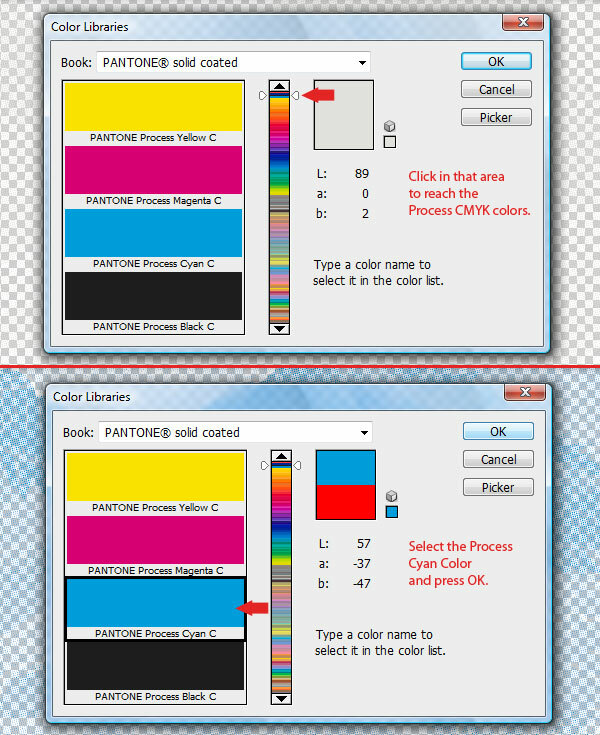 Once you’ve found them, click on the Pantone Process Cyan C and press OK for both menus. Now we’re off to the next color: Magenta. Add another 30 Degrees to the angle. 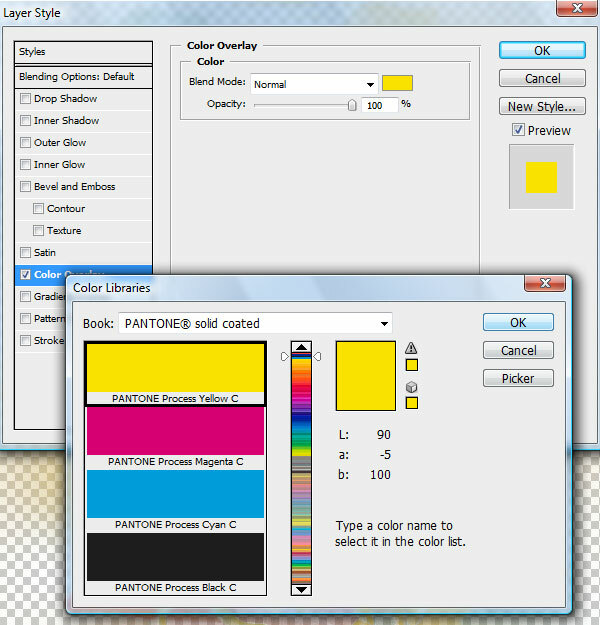 After you’ve positioned each layer inside the Black document, rename each layer according to its color. You’ll notice that the image looks odd, because all the colors are off. 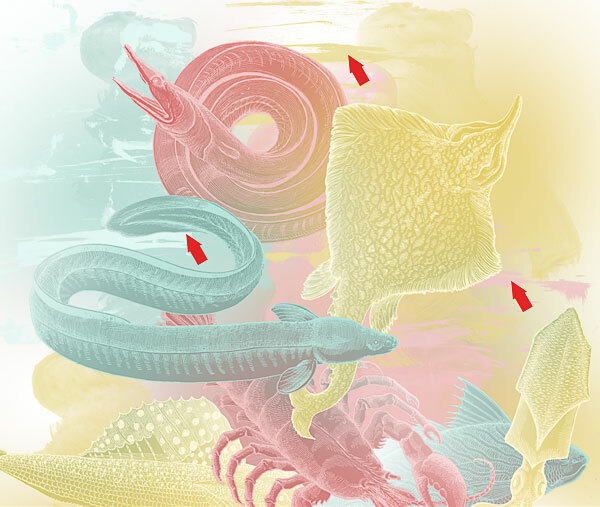 That’s because all the colors that you achieve in CMYK print come from overlaying these four colors. If you want green, you multiply yellow over blue. For red, place magenta over yellow. 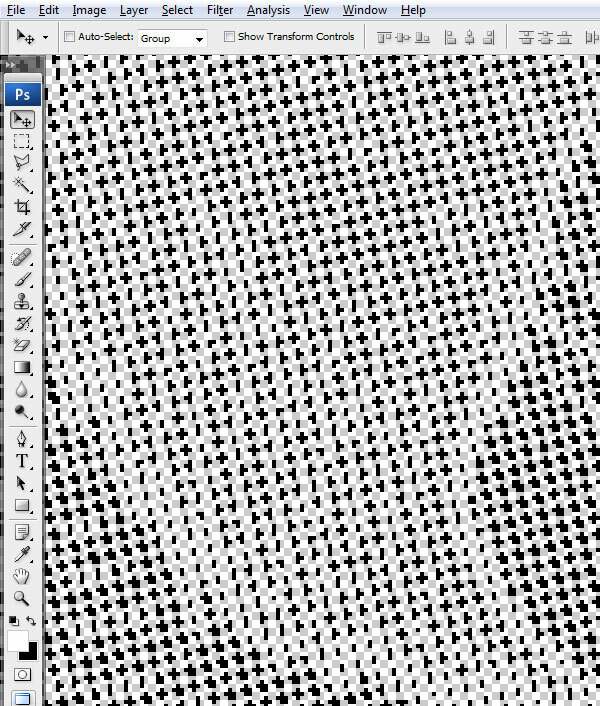 To be able to do exactly that, we need to place each layer on Multiply and let the halftone colors interact. Since they have a Color Overlay applied to them, that makes all blending modes redundant. 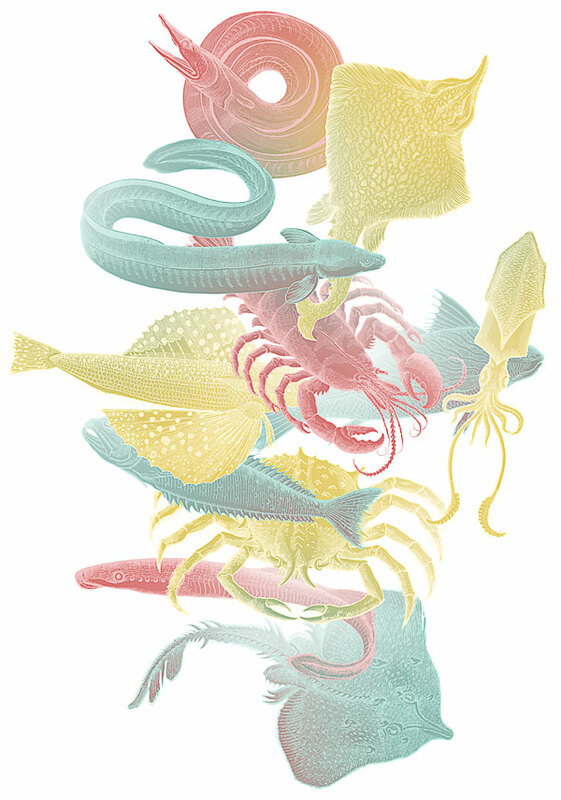 With that, the CMYK Color Separation is now finished and ready to be sent off to the printer. 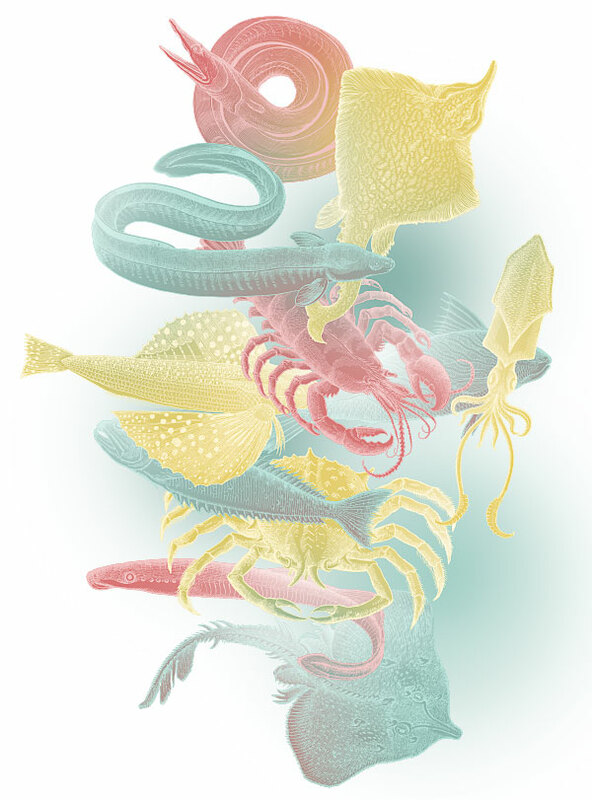 Below, you’ll see a large close-up of how the four CMYK colors interact and generate other ones as well. Well, that’s it! Although many t-shirt sites or companies might do this whole process themselves, simply understanding the technique allows you to know what your options are in t-shirt design. You can also rely on this type of printing to create t-shirts from real photos, which is great news for Photoshop users. Not all the graphics need to be flat, and now you have the possibility to integrate gradients, textures, photo effects, and much more. 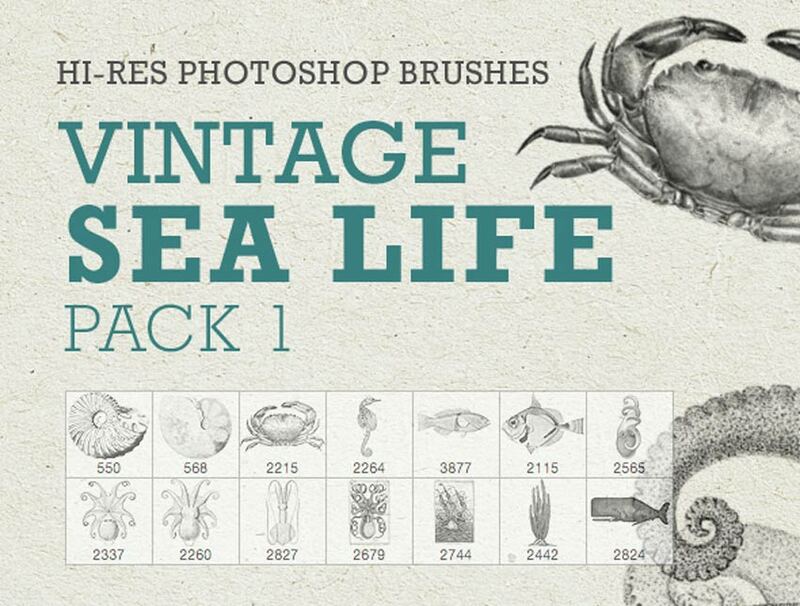 Bring any design to life with this awesome vintage-inspired sea life pack. This pack features 14 high-resolution illustration brushes to make your designs pop! It’s great for backgrounds, collages, and more, so you’ll definitely want to add this pack to your collection!